This month’s challenge was by far the most challenging in my opinion. 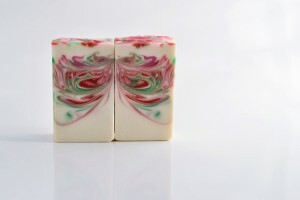 The butterfly swirl technique requires that you pour two or more contrasting colors in your base soap and then use a hanger tool to try to create something that looks like a butterfly when the soap is cut. Keep in mind that you cannot see what is happening in the soap batter as you move the hanger about. 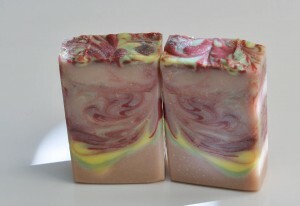 There is a very talented soaper, Zahida of Handmade in Florida, who has perfected this technique – she creates such jaw dropping beautiful soap. Her videos make it look easy but believe me it is not. For the second attempt I decided to use Crisp Apple Rose fragrance and keep the base white. For colors, a red juicy apple and pink roses came to mind with some green for the leaves. It seemed that using a little less color might produce better results but it is so difficult to hold back and this still has just a bit more than planned. The soap performed well and gave me lots of time to work. Did I mention this fragrance smells wonderful? I can see a butterfly – can you? I am definitely not through with this technique – it will be on my list to try again soon. Even when you don’t get a perfect butterfly the swirls are still so pretty. Thank you Amy. This was really fun. I’m so jealous that you have a tall skinny mold to play with! You’re right – this was definitely one of the most difficult challenges to date, but I’d say you did a great job. Love the color contrast of the second soap – I bet is smells amazing too! OMG that turned out beautifully. Love the color choices for your Crisp Apple Rose as well as the butterfly you got. 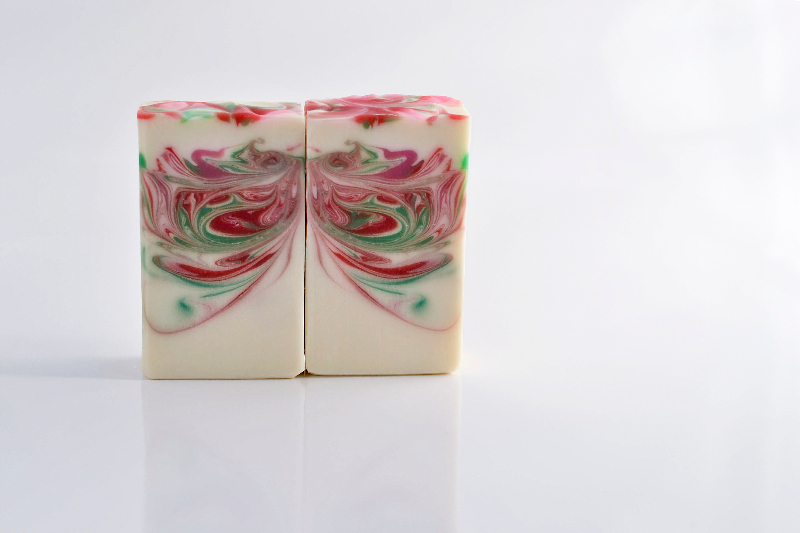 They’re both lovely, but the pink, red and green swirls are my favourite. Love the colors and they’re perfect for the scent! Your soaps are very beautiful. Great job on your swirls. I love crisp apple rose too 🙂 beautiful soap !